Our theme this week is a fairy tale: children lost in the woods, foraging for mushrooms and nuts. Killing and skinning a rabbit. And making a pot of soup? Our soup cooks may have different tales to tell, I suppose. Come find out what the woods mean to Sarah Dandelles, Bari Singh, Katie Hochslauer, Hacee Southam, Ross Outten and Lisa Hoffer this Wednesday, January 22, when they step up for a turn behind the crocks. As ever we’ll have bread from Publican Quality Meats and Crumb Bread, and our special guest DJ is the lovely Nora O’Connor Kean, making her Soup & Bread debut. 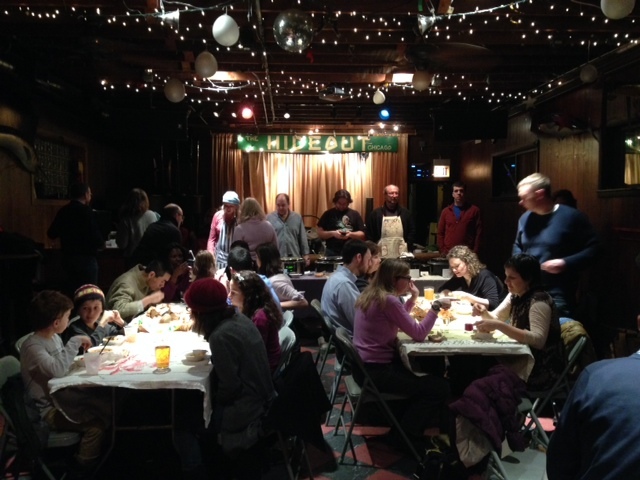 Pay what you can donations benefit the Association House food pantry in Humboldt Park. And many thanks to our cooks from last week! We raised $540 for the Marjorie Kovler Center and our only regret is that we ran out of food so soon. Apologies to those who showed up to find the crocks run dry. We’ll try to do better this week! © 2014 Soup and Bread. All Rights Reserved.